After my rant about how dumb it is to base your retirement needs on your income rather than your spending, you might guess that I hate most online retirement calculators. You are correct. 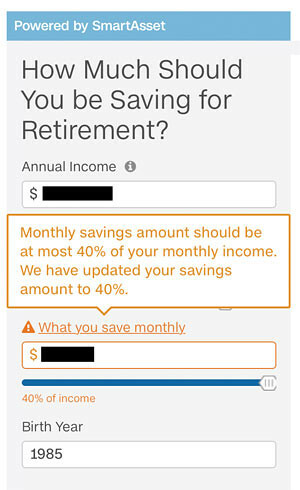 The vast majority of online retirement calculators use your current income to compute how much you need to save for retirement. It's dumb when financial advisers do this, and it's even dumber when automated programs do it. Retirement calculators tend to be dumb in lots of other ways too. When computing how much to save for retirement, they tend to focus on current income rather than current spending. Plus, many of them have other problems — like arbitrarily deciding that you shouldn't save more than 40% of your monthly income. Today I want to share brief reviews of the Personal Capital retirement planner and the retirement planning tool from NewRetirement. Both of them are awesome. I've also included five more online retirement calculators that actually provide meaningful results: cFIREsim, FIRECalc 3.0, the early retirement calculator from NetWorthify, the retirement income calculator from T. Rowe Price, and Bankrate's retirement income calculator. 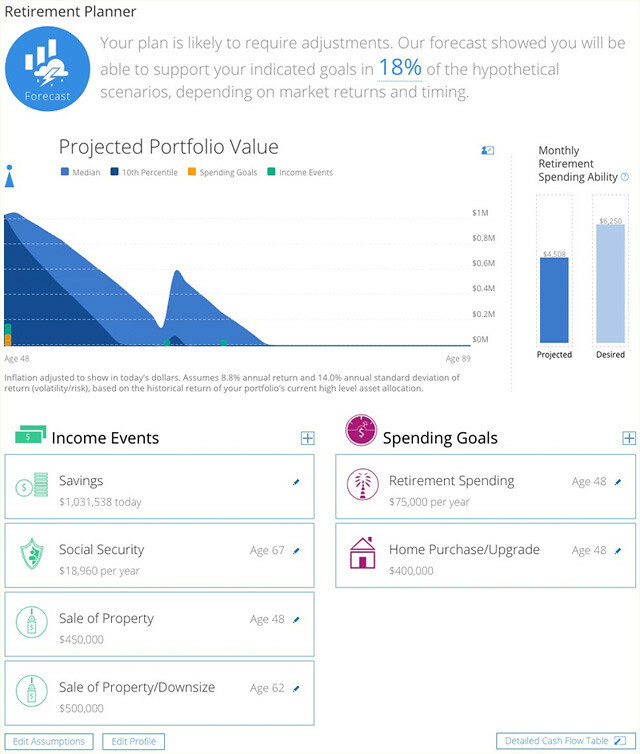 First up, let's look at the retirement planner built into the free Personal Capital app. I raved about this tool when I compared Mint and Personal Capital in February, and for good reason. It offers a lot of flexibility, allowing users to enter a variety of possible spending goals, such as vacations, weddings, education, and home purchases. You can also account for changes in income. 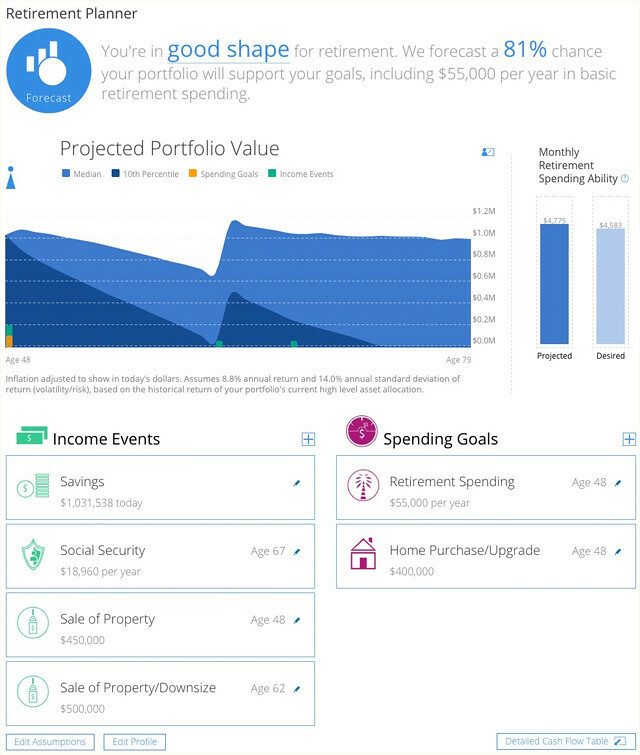 The Personal Capital retirement planner allows users to create a highly-customized projection of income and expenses on the road to retirement — and beyond. But the Personal Capital retirement planner goes beyond customizing assumptions about your own life. You can also alter larger economic factors such as life expectancy and inflation rate in order to learn how these changes could affect your future cash flow. As always, let's look at a real-world example. Note that these calculations also take into account the “income events” and “spending goals” that I've fed into the system. Because Personal Capital is already connected to all of your bank and investment accounts, its default is to project your future retirement spending based on your current actual spending. If you don't have a lot of unusual expenses, this might be fine. In my case, however, it thinks I spend far more than I do because it can't recognize that certain transactions are actually investments and not blatant consumerism. As you can see, the Personal Capital retirement planner calculates that I have an 81% chance of being able to fund the retirement I envision. Not bad! But let's look what happens if I alter a few key assumptions. What if inflation is just a little higher than the historical average? And what if I surprise myself by living a decade longer? And what if my spending is actually higher than I think it is? Trouble happens, that's what! You can see that increased spending and increased inflation would have a huge impact on the longevity of my portfolio. All the more reason I want to continue earning money while cutting back on spending! Here's one final thing I like about the Personal Capital retirement planner: While the default graph is handy, it's not nearly as useful as raw data — at least not for this money nerd. Fortunately, you're able to view a detailed cash flow table, which shows you an annual projection of your portfolio value based on both average and poor markets. Regardless which online retirement calculator you play with, it can be handy to supplement your info by using the U.S. government's Social Security retirement benefit estimator. (Well, assuming you live in the U.S., anyhow.) Enter your vitals, and the calculator will project how much you should receive each month based on your actual earning records. For instance, I'll receive an estimated $1580 per month ($18,960 per year) at full retirement age of 67. Handy! As much as I love the Personal Capital retirement planner, there's another tool that's even better. The retirement calculator at NewRetirement is comprehensive but still easy to use. It doesn't connect to your bank accounts, so you have to enter info by hand — but that's okay. NewRetirement allows users to save data — you're required to create a login — so you can go back again and again to tweak your assumptions. 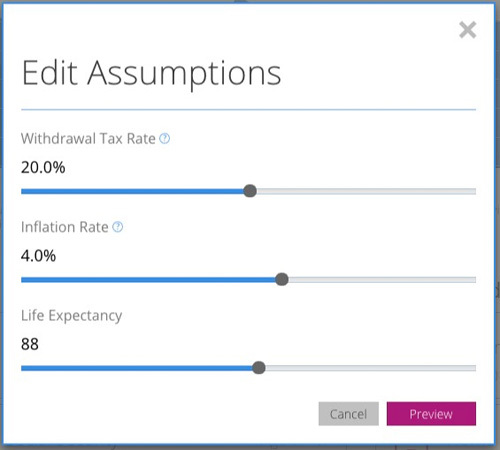 As flexible as the Personal Capital planner is, the NewRetirement tool is even more customizable. NewRetirement allows users to enter tons of info, such as life expectancy, estimated Social Security benefits, anticipated changes in income, possible windfalls (from inheritances, for instance), evolving monthly expenses, predicted medical costs, and current debt load (and predicted payoff dates). Because you enter a wider range of data, you're able to make more adjustments. After you've set your basic assumptions, you can page through each section to tweak your numbers. As you do, NewRetirement provides advice and links to outside resources such as a life expectancy calculator and the afore-mentioned Social Security benefits calculator. 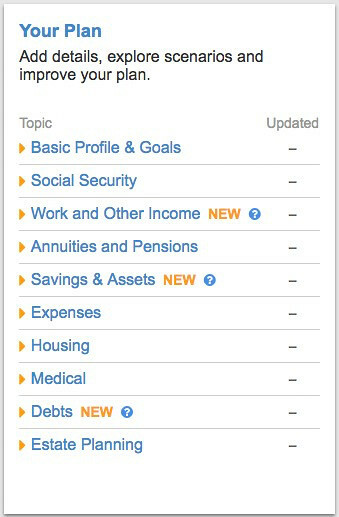 NewRetirement also provides opportunities for users to learn about topics like debt consolidation or estate planning. When I entered a predicted inflation rate, I chose 3.5% on the optimistic side and 4.5% on the pessimistic side. When I entered a predicted average rate of return on my retirement accounts, I chose 6.5% on the optimistic side and 2.5% on the pessimistic side. When I entered a predicted rate of increase for my home value, I chose 8.0% (the max) on the optimistic side and 0.5% on the pessimistic side. When I entered a predicted rise in health-care costs, I chose 5.0% on the optimistic side and 10.0% on the pessimistic side — and this had a dramatic impact on my ability to meet my goals! I'm not sure why there's a huge spike in my spending at age 77, but I suspect it's due to predicted end-of-life care. Kind of morbid, eh? But wait! That's not all! After you've entered and analyzed your retirement plan, NewRetirement allows you to do all sorts of things with it, such as review key dates in the future and compare your finances to folks in your neighborhood. The NewRetirement tool is far more comprehensive than most other retirement calculators. It's a resource, not just a gadget. Best of all, the developers are constantly adding new features and making improvements, both large and small. If you like detail, then cFIREsim is for you! This crowdsourced (and Open Source) retirement simulator allows you to enter tons of different parameters. New or casual users might find it overwhelming, but because of its depth it offers accurate and realistic results. FIRECalc 3.0 uses a similar methodology to cFIREsim but requires far less input. You tell the calculator how much you have saved, how much you plan to spend each year, and how many years you plan to be retired. FIRECalc compares these numbers to every U.S. stock market since 1871 to determine whether your money would have lasted. Quick and easy but far more sensible than trying to guess how much you need in retirement based on your current income. The excellent retirement income calculator from T. Rowe Price bases its results on your spending needs. You supply your current savings and salary, specify an asset allocation, then tell the calculator when you expect to retire and how much you anticipate spending. The program runs “1000 market simulations” to determine how much money you'll need, then compares that with how much you're expected to have. Looking at the results from just one retirement calculator isn't very useful. But if you compare the numbers and recommendations from several, you can get a pretty good idea of how much you'll need to save for the retirement you want. cFIREsim says that, based on past U.S. market history, I am 100% safe to spend $47,291 per year (or $3941 per month). With FIRECalc, I had to run the numbers several times to find the lowest level of annual spending that would have lasted forty years 100% of the time. It's $46,750 (or $3896 per month). T. Rowe Price says I can afford to spend $3820 per month — more once Social Security kicks in. Networthify doesn't give me any useful info. 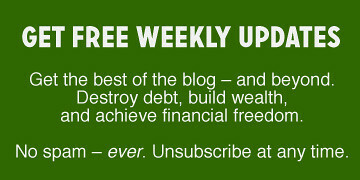 It's meant for folks who have not yet achieved financial independence. Bankrate says I'm able to spend $6014 per month. WTF, Bankrate? Why are your numbers so far off from everybody else? It seems pretty clear that I can safely spend nearly $4000 per month for the next forty years and I won't run out of money. If I'm willing to take a chance and/or supplement my income, I can probably bump that to $5000 or $6000 per month. Since my normal burn rate (when I'm not traveling the U.S. in an RV) is about $3000 per month, I should be fine. I wrote about online retirement calculators last summer because I wanted to crunch the numbers to see if I was spending at safe levels. I'm worried about burning through my savings. At the time, based on my assumptions, I thought I was okay. cFIREsim says that, based on past U.S. market history, I'm 100% safe to continue spending $60,000 per year (or $5000 per month). 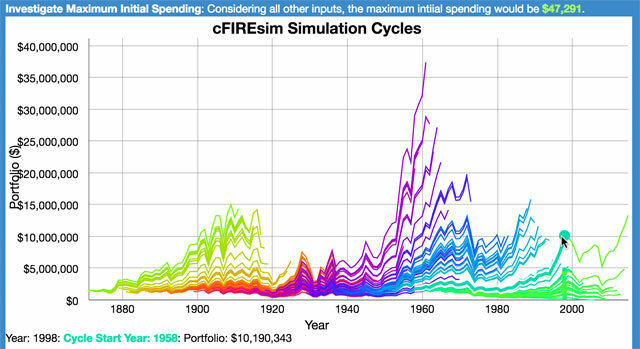 FIRECalc shows that my current spending would be sustainable 98.3% of the time. To reach 100% success, I'd have to cut my spending to $57,500 per year (or about $200 per month). The calculator at NetWorthify still doesn't handle my situation well. But based on what I can tell, it seems to think my current spend level is 100% sustainable indefinitely. According to T. Rowe Price, there's an 83% chance that my current spending level will allow my savings to last until I reach age 78 — but that's not counting on future Social Security benefits. The Personal Capital retirement planner shows that my current level of spending has a 72% chance of success. I need to cut back to $4833 per month to boost my odds to 80%. The NewRetirement tool gives both optimistic and pessimistic projections. 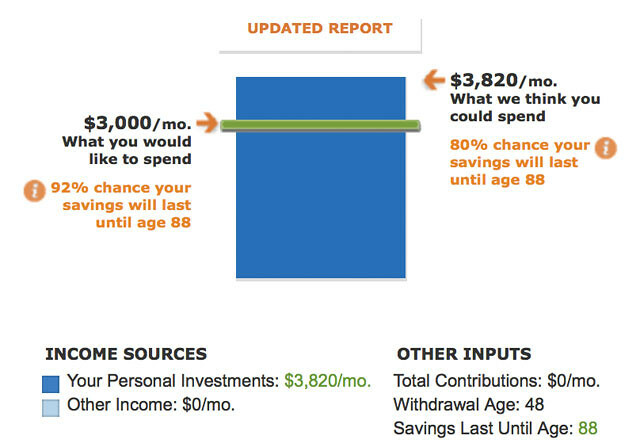 Optimistically, I have a 93% chance of funding retirement until age 78. Pessimistically, my chances are only fifty-fifty. My own rule of thumb — that you can safely spend 4% of your net worth long-term (or 3% of you want to be extra safe) — indicates that I can spend $5370 per month without issue. If I want to be conservative, I should spend $4475, which would require cutting back by about $500 per month from current levels. So, I'm not in bad shape. Based on my current spending and retirement savings, the best retirement calculators generally think my burn rate is about where it should be. But because I want a margin of safety, I'm going to continue to take steps to improve my odds. I'd love to hear your feedback about these retirement calculators, especially the two new tools I reviewed today. What do you think of the Personal Capital retirement calculator? Take the NewRetirement planning tool for a spin. Do you like it as much as I do? There are 18 reader responses to "Picking the Best Online Retirement Calculator". Ha! Love that you’re still ranting! What I did was run my retirement spending numbers myself to know EXACTLY what I’d be spending. When I had enough income generated from assets to cover that, I knew I had enough. Case closed. At least there are calculators out there that do make sense. cFIREsim, FIRECalc, T. Rowe Price, and your conservative rule of thumb are very much in agreement. Unfortunately, CNN and Bankrate receive much more traffic, and I’m sure their silly calculators get much more use than the useful ones. I don’t think the numbers change much if you look further out, but if you’re in your forties and reasonably healthy, which I believe you are, you could be looking at more than forty more years. But if the portfolio can last forty years, it’s likely to last indefinitely. Cheers to a long and healthy retirement! I believe the T. Rowe Price site points out a big flaw for early retirees. If I retire at 57 and don’t plan to take Social Security until I’m 70 I could be underspending from my savings for the first 13 years. Then I get a large bump at 70 (a year before RMDs). This would provide me with a larger retirement income just before I expect to start my Slow-Go years (probably around 75-80). Shouldn’t I be withdrawing more in the pre-SS years from my savings? Fritz at The Retirement Manifesto has a Retirement Cash Flow Model that I feel adequately takes this into account. I think the problem with the calculators is they try to pump out a starting monthly retirement income and then only increase by inflation. Using a spreadsheet that allows for including different cash flows annually (SS start, purchase a new/used car, take a dream vacation, or receive an inheritance) is a much better way to calculate and then sustain a future vision of your retirement cash flow. Granted a spreadsheet is much more work than a calculator but it allows much better what-ifs and if maintained annually accounts for market performance each year and can warn you if spending cut-backs are needed (or splurges are warranted). I stick with your rule of thumb, because I like things where I can see the inputs and understand them. As it stands, I’ll be older than you when I reach early retirement and thus my funds most likely won’t have to last as long. I’ll have to check some of these out! Also, it’s reassuring that they (with one exception) gave you similar results. Hey, great to hear from a guy like you that my calculator is top-notch :) I’m always happy when people think that cFIREsim is helping them sleep better at night about their retirement plans. All of those numbers are interesting, but I’m not sure how useful they are. You said it yourself: the calculators essentially confirmed what you already knew. Having the information can be empowering, but they also make the concept of retiring quite a bit more complicated than it really it. 3-4% withdrawal rate is simple, unintimidating, and super useful (as long as people remember caveats about asset allocation). This is opposed to these calculators that are interesting, data rich, and will scare the heck out of people. You have just traded what is essentially a single number (two if you include the 50/50 bond/stock allocation)and expanded it out to requiring projected inflation numbers etc. The thing is: inflation (and many of the other parameters) is already baked into the cake of “4% withdrawal”. Few people are numbers geeks like us. For example, my dad has me do his taxes. The other day he asked me how much of a refund he is going to get back. Since I didn’t have it in front of me I told him he has no federal tax liability so he could add the withholding on his two 1098s and that’s his refund. He had no clue what I was talking about. There is NO WAY he could use a tool like this, and the people that can (like us) probably don’t really need it anyway. thanks for the share – these kinds of posts really bring tremendous value – I cant way to start crunching – thank you. When projecting out retirement numbers, consider semi-retirement also. By keeping a PT job, with flexible scheduling, you can still take time to travel, for example, without completely cutting the cord. Add a PT income of $800 to $1000 a month to your projections, (Many consultant type gigs and “hobby” type jobs are capable of that income). You will need to withdraw less from your nest egg and can semi-retire earlier than a full retirement. Combining PT income with downsizing and dropping a 2nd car was very helpful to my wife and I and allowed us to semi-retire about 5 years earlier than planned. We travel, and even snow bird each winter. For us, it is the best of all worlds. First time comment. I love this analysis. I’ve only used cfireism so this will give me some other tools to try. With respect to your spending and your investments though isn’t it all a mute point since you have a blog that generates income? One of my thoughts in RE is that I will consult some to keep my mind active. I am conservative so I will RE with enough so that I don’t need an income from consulting to meet my needs. I figure if I pay for even 25% of my RE needs then I will allow my investments to continue to multiply. Hi JD, Good review of the retirement calculators. I did a hack recently using cFIREsim to account for the high market valuations. While PC has a good calculator, I find cFIREsim to be more nerd-worthy for a numbers geek like me. Btw, why do you model only till age 78? I enjoyed your retirement calculator reviews. I have been using Personal Capital going on a year now and really like it. It helped my husband and me decide to wait until 70 to take Social Security and in the meantime live off of our investments after we both retire. I enjoy playing with different retirement scenarios with the tool. 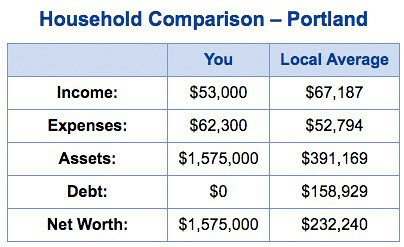 flexibleretirementplanner.com is still, in my view, the best retirement calculator available. Free. Does Monte Carlo simulations. Customizable. I’m regularly surprised by how little it gets mentioned. I’m not affiliated with it all, but have been using it for a long time to help me with my planning. The best part of NewRetirement, in my view, is Zip Code retiree comparisons. Currently we live in a neighborhood which is about 125% above the COL national average and the average income here is around 4 x our retirement income. While our net worth is substantially higher than our neighbors eventually it will be chipped away if we are fortunate enough to live a long time. Frankly we had ruled out Colorado has a retirement possibility but the NewRetirement comparative data has provided us a different perspective about some towns closer to the National COL average that we had not considered before. At the end of the post, there is a statement of a common rule. Divide savings by 25 to calculate how much you can spend. Does this rule reflect taxes or not? have $40,000 per to spend *before* tax. have 0.8 * 40,000 to spend = $32,000 ?